An iconostasis (also iconostas or icon screen) is a screen or wall which serves as a stable support for icons and marks the boundary between the nave and the altar or sanctuary. The term can also refer to a folding, portable set of icons. There has been historically and continues to be a vast range of styles for iconostases: Some are simply two icons of the Theotokos and the Lord; the most complex, cathedral icon screens have multiple tiers with many icons per tier. 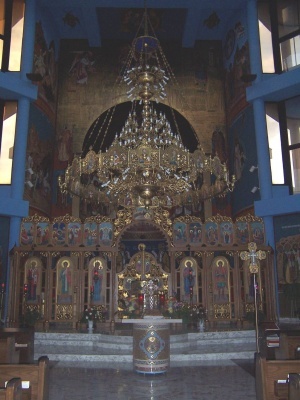 The iconostasis is perhaps the most distintive feature of Byzantine Rite churches. It evolved from the Byzantine templon, originally a small rail without icons that marked the boundary between the nave and the altar. An icon of the Theotokos with the Lord. This indicates the beginning of the end of time, the time of our salvation. An icon of The Lord, usually as All-ruler (Pantocrator), the just judge of all our works. This indicates the end of all time, the awesome day of judgment. Icon of Saint John, the Prophet, Forerunner, and Baptizer of the Lord. Icon of the patron of the temple, or of its patronal feast. The Holy Doors (or the Royal Doors). These usually are a diptych of the Annunciation. Sometimes they may also have the icons of the four evangelists. This entrance is reserved for the use of the bishop, and the priest when he is carrying either the Gospel book or the chalice containing the holy Eucharist. In other words, it is reserved liturgically for the use of Christ as master and Lord. North door (the north and south doors are often called "deacon's doors"). This will often depict an archangel, almost always St. Michael. This door is liturgically the exit from the altar, often interpreted mystically as heaven. Thus, St. Michael guards the door to heaven. This icon is also sometimes a deacon, usually St. Stephen the Protomartyr. South door. This door is the liturgical entrance to the altar, interpreted mystically as heaven. The archangel on this door is St. Gabriel, whose announcement to the Theotokos marks the beginning of the Incarnation, which is our entrance to the heavenly realm. If a deacon is depicted, it is usually St. Philip or St. Lawrence. These icons (when present) are usually saints especially near to a parish or nation, such as Ss. Nicholas of Myra, George the Trophy-bearer, Demetrius the Myrrh-streaming, Sergius of Radonezh, Andrew the First-called, Herman of Alaska, or Seraphim of Sarov. This is usually the icon of the Mystical Supper, the last supper our Lord ate with his friends and wherein he instituted the Eucharist. This page was last edited on April 2, 2010, at 16:52. This page has been accessed 74,826 times.